James Otto is hitting the TV airways this weekend — sitting down with folks at GAC for one-on-one interviews and to talk about his newest video Just Got Started Lovin You. It’s a great video, too! He’ll be in interviews with Nan Kelly during the Top 20 Countdown, plus debuting his video. That’s not counting the fact that you can catch him on CMT’s Gone Country, as well! Yep, he was on tonight’s new episode — both at the John Rich mansion and at their first ‘live’ gig at Fuel in Nashville. 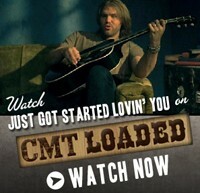 And his video for ‘Just Got Started Lovin You’ has been placing on CMT for awhile now. His is definitely a voice you want to listen to! Jim and I saw him at City Hall (a club here in Nashville) on November 5, 2007. And yep, he sang that song. And of course it was AWESOME live. I first heard it on his MySpace page many months ago. Jim and I have been following James Otto since March of 2006 — the day I happened upon one of his songs on a website. After a quick search of his schedule that night, we noticed that he just happened to be performing a few days later right here in Nashville. So we went. We were immediately hooked, and have been eagerly awaiting the release of his new album. We have played his first album (Days Of Our Lives) til we practically know each song backwards! Aside from that striking voice that sends chills down my spine (but not so much down Jim’s), we really like that he’s such a talented songwriter. And guitarist, too. He’s just an all-around great musician and we can’t get enough of him. You can also get up close & personal with James Otto by checking out the James Otto Channel on YouTube. James Otto’s newest album Sunset Man which features the song ‘Just Got Started Lovin You’ will be released on April 8th.